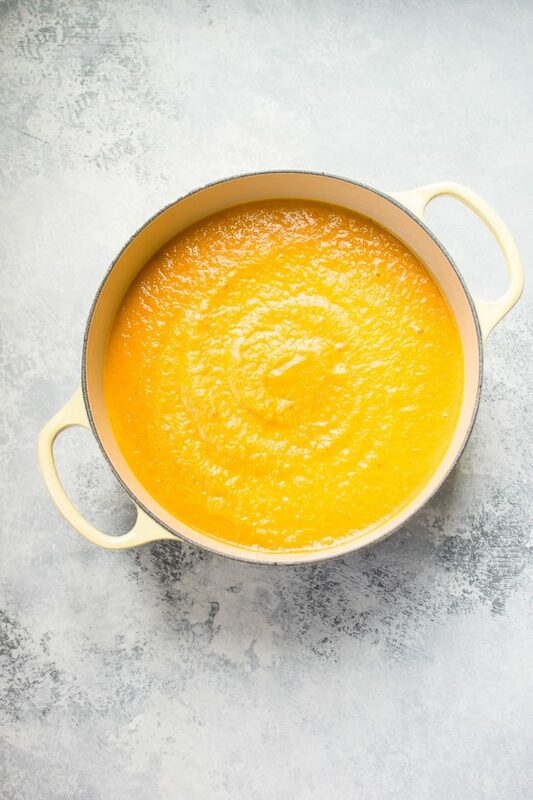 This vegetarian acorn squash and carrot soup is healthy, fresh, flavorful, and takes the chill off. This post was originally published on October 19, 2015. I am going through and updating some of my old posts with new photos, better info, and more clearly written recipes. I’m not the biggest fan of fall, since here in Alberta it means that we’re soon going to have half a year of cold weather. Sure, the leaves on the trees are quite beautiful… until we have a windy day and they’re all blown off and then everything is dead until May. Bah humbug! I haven’t made this acorn squash soup since I first made it for the original blog post, and I forgot just how good it is! This soup is really easy to make, and it’s been fairly popular since I published it. 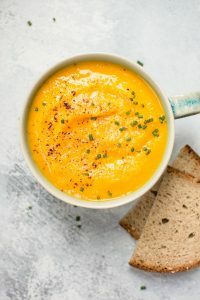 I figured it was time to update the photos and word the recipe a little more clearly so that hopefully I can get more eyeballs on this winter squash soup. More eyeballs on it = more happy tummies. I love carrots. Somehow, though, I always seem to eat them in bursts vs. consistently. Fresh carrot juice is my favorite, and I’m all over carrot soup. This soup contains butter, so it’s not vegan as written, but you can make it vegan quite easily by omitting the butter if needed. I had some fresh chives on hand, and they make a wonderful topping for this soup, but they’re optional of course. 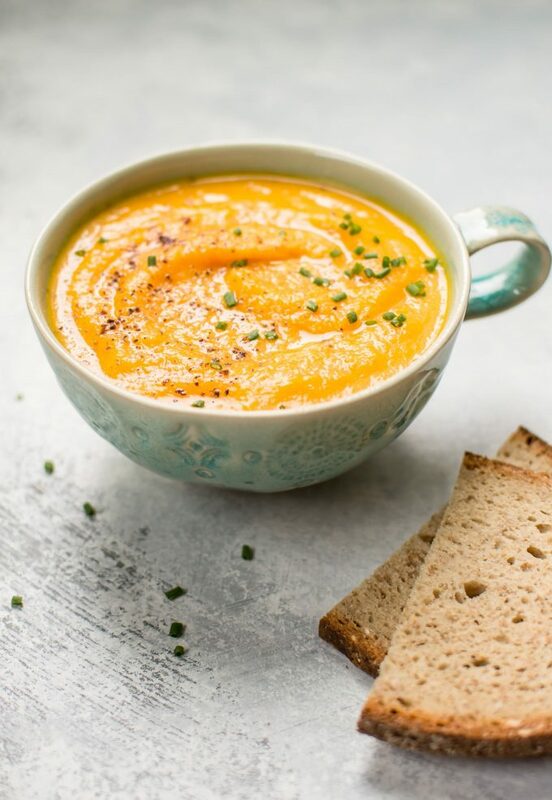 Hope you love this squash and carrot soup! 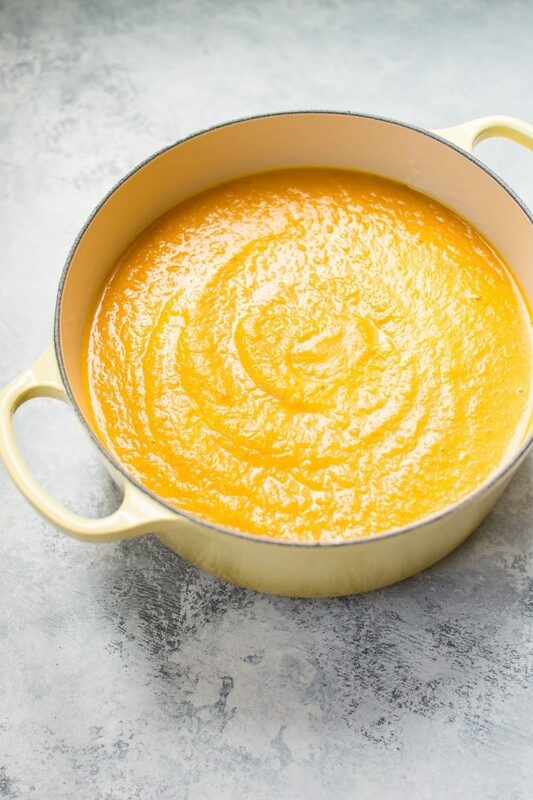 This easy squash soup is healthy, fresh, full of flavor, and takes the chill off. Prep your squash and carrots. To peel the squash I cut it into quarters (or smaller if needed) and then peel each piece using a potato peeler. Chop the onion and celery. Melt the butter and olive oil on medium heat in a large pot. Add the onion and celery to the pot, cook for about 5 minutes on medium-high heat, stirring often, until softened. Add the vegetable broth, water, squash, carrots, Italian seasoning, and garlic powder to the pot. Bring soup to a boil and then cover it with the lid slightly ajar, and simmer on medium-low heat for about 30 minutes or until the veggies are softened (it may take more or less time depending on how small you chopped them). Working in batches, blend the soup until it's smooth. I recommend letting it cool for at least 15 minutes prior to doing this. You could also use a stick blender, but I prefer the results with a regular blender. Season with salt & pepper to taste and serve immediately. Can be stored in the fridge for several days or frozen for 3 months. I like to serve this soup with snipped fresh chives (optional). 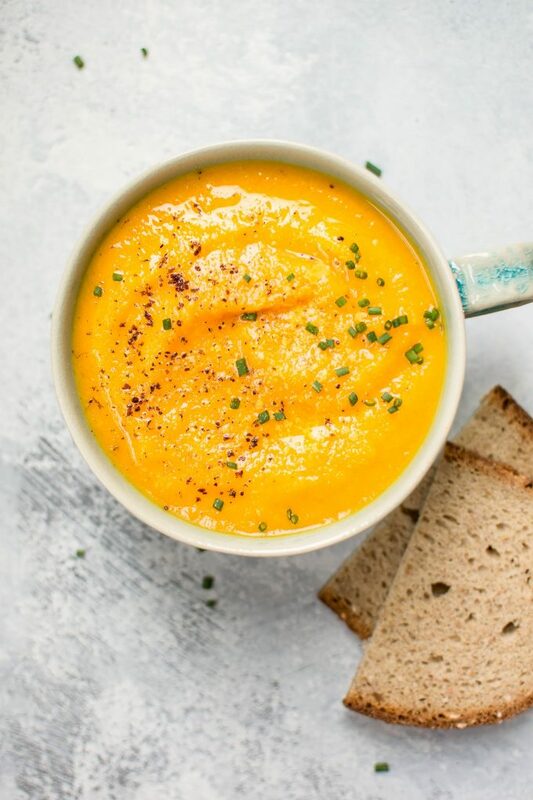 Looking for more cozy fall soups? You may also like my pumpkin and cauliflower soup with ginger or my corn and cauliflower soup. Ooh, I love acorn squash, but don’t have a reliable soup recipe. I’m going to try this on the weekend. Do you think it would blend if I kept the skin on the squash? I don’t mind a few chunks. Two thumbs up! 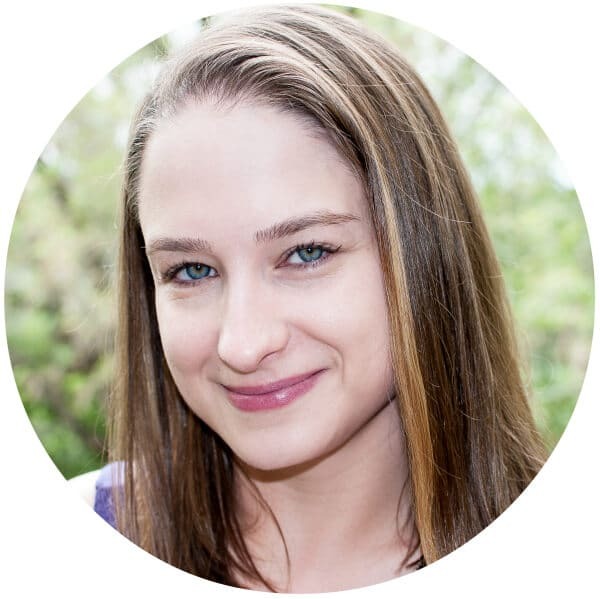 I decided to keep the skin on – I couldn’t bear to throw away all of those nutrients. You’re right, it did blend. One unexpected result was the colour – the green from the skin combined with the yellow/orange of the rest resulted in a gross-looking brownish-yellow. The taste was great though! I would probably peel the squash if I was serving to guests. My husband and I can eat the brown soup, haha. How much creme or half and half do you use? I have made acorn squash soup in the past and it is very satisfying. I will try your recipe too. I have my own homegrown acorn squash and need to use some of it. The rest I am going to roast in the oven and then puree and then freeze for later. They also store well in a cellar or a cool room for a few months. Yum! I just bought acorn squash without a recipe in mind. This looks yummy- I think I know what to do with that squash! If you ever put up a toasted pumpkin seed recipe, please cross-post here. My acorn squash had so many seeds in it, I was able to toast them while waiting for the soup to cook. I rarely do this, so had to search around for instructions. Did the toasted seeds taste good? They are addictive! They taste just like pumpkin seeds – it brings me back to when we would carve pumpkins for Halloween and my mother would toast the seeds. I loved this recipe. i stuck to it closely except that I used chicken stock instead of vegetable. Reaction from the family? “Delicious,” said a chorus of happy voices. That’s great, Barbara!! Thanks for trying it. 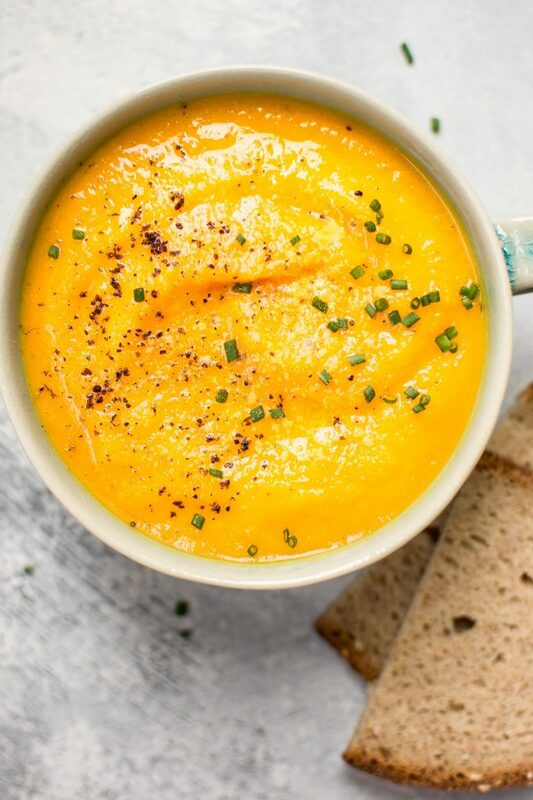 I just made a butternut squash with Rosemary and ginger soup that I’m really happy with the flavor but I havnt tried acorn squash yet. I’ll have to try making this soup. It sounds easy enough. Hope you enjoy it! ???? Has anyone tried roasting the squash (and even maybe the carrots) first and then adding them accordingly? I added the squash to boiling water for 15′ and it was much easier to cut it after. I also toasted the seeds with salt pepper & olive oil – I tried toasting the skin but it is not very good. Great recipe!! This soup was delicious. Made it last night but did not have all ingredients on hand. I used chicken stock and potatoes, as didn’t have celery celery on hand, delicious results! Perfect for cold nights, yum! I’m confused by the poster who questioned how much cream. There is no cream listed in the ingredients. Should it be? Hi Christine! I believe that when I originally published this recipe, I wrote in the post somewhere that you could add a bit of cream to the soup if you were so inclined. It’s definitely not necessary, and I don’t even list it as optional since I really don’t think it needs it at all (especially since I re-made the soup again recently). I ended up adding about 1/2 cup of full fat canned coconut milk that I had leftover. It turned out delicious! Excellent! I love adding coconut milk to soups. Glad you liked it. Wow! So glad I had this saved on my pinterest board. I’m currently sitting, cuddled on my couch, watching freeform with a nice bowl of this soup in my lap. Only thing different I did was top it with Sumac to add some tang! This is absolutely delicious. Thank you for the recipe! That’s great!! I wish I was as cozy as you right now haha. So glad you liked it! Hello, I just wanted to ask if you thought this soup could be made in my vitamix blender? It’s supposed to get hot enough to cook things, but I didn’t know if that would affect the flavor because the ingredients would be blended before cooking and might not caramelize like when items are cooked in a pan. Hmm that’s a very good question. I actually am planning on buying a Vitamix (or similar) soon. I just have a normal blender, so I have zero experience with this! I’d give it a try. I’m curious. If this was a roasted veggie soup, I’d say that yes you will lose flavor, but other than the onions sautéing, I’m not sure that the flavor will be compromised too badly. I too purchased a squash without any particular intentions. Just so happened to have carrots kicking around. I like how this recipe doesn’t call for cream or milk as we generally don’t have any in the house. I am very impressed with myself and this recipe after making this. It’s delicious! I’m so glad it worked out for you, Shauna! !